Although beef is still number one among burger eaters, Technomic’s Burger Consumer Trend Report found that Americans would like a little diversity between the buns. Lamb has made its way onto many menus and this lamb burger with lemon-rosemary aioli is one to try. On baking sheet, place eggplant in single layer. Sprinkle both sides of slices with 1 tsp. salt; set aside. In med. bowl, combine lamb, garlic, remaining 1/4 tsp. salt and pepper. Lightly shape into 4 thick patties. Rinse eggplant; pat dry. Brush eggplant slices and tomato slices with oil. On grill, cook eggplant and tomato, covered, over med. indirect heat 14 to 16 min. Cook lamb patties, covered, over direct heat 7 to 9 min., turning once. Spread 1 tsp. aioli on top buns and 2 tsp. 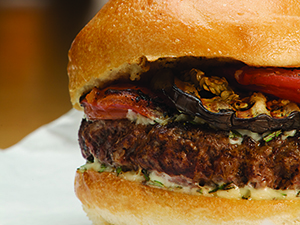 on bottoms; top with burger, eggplant slice and two tomato slices. Combine all ingredients; mix well and refrigerate.